respiratory, reproductive, digestive and urinary tracts. is an anti inflammatory, antihistamine, antioxidant. Vitamin D helps to absorb calcium and phosphorous. metabolism of excess fat and thyroid function. of liver and maintenance of strong bones. as well as many other functions. with vitamin E. It protects the immune system from damage. energy at cell level and other internal growth. Calcium maintains growth and support of bone structure. Iron combines with protein and copper to assist in hemoglobin production and is needed for stress and disease resistance. Magnesium helps regulate acid/alkaline balance, promotes absorption and metabolism of other minerals, especially calcium. Protein (animal/complete) provides amino acids. 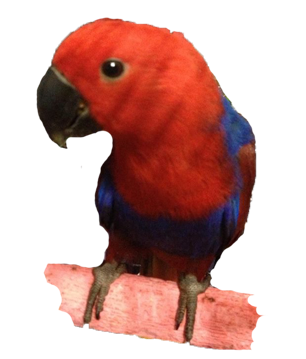 Animal protein is only required for Eclectus chicks and breeding hens. It is not a recommended normal diet for the Eclectus parrot, they thrive on a vegetable protein diet rather than an animal protein diet. Zinc helps enzymatic reactions, carbohydrate digestion, facilitates the action of B's, circulation, liver function, immune system function, protein synthesis and cell growth, skin, bone, joint health, wound healing and growth of reproduction organs. A list of some fruit and vegetables with their nutrient contents. This is just a very small list. If you google a specific foods nutritional contents you be able to get more thorough information on that food. This list is going by specific vitamins and how they benefit.